We plan this hike as training and acclimatising hike before Mount Whitney. 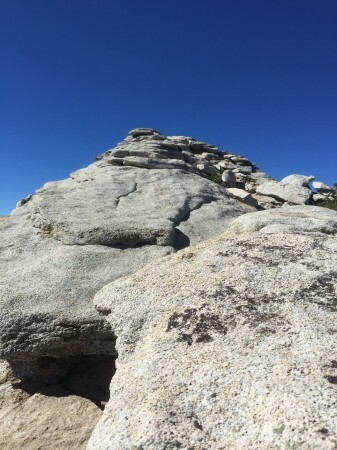 A few months ago I was looking on AllTrails.com and it looked like it was possible to avoid the sharp ridge just before the summit by traversing the east «face» of Clouds Rest and join the trail from the Yosemite Valley. Is that really possible ? Just want a backup plan; sometimes I find it scary if it is very steep on both sides of the trail. I've only been up the east side of Clouds Rest once many years ago, but I sure don't recall it being anything scary, or like a "knife edge" ridge at all. I was on top from the west side just a few years ago, and there is quite a bit of flat, open space on top. I can see on the Google Satellite view that there is a zig-zag trail that drops off to the south, and then joins the trail coming up from the west, but I don't think you would really need or want to use it. 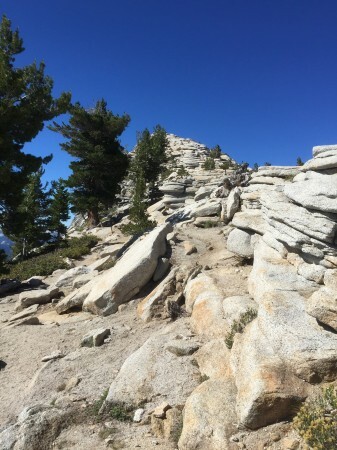 If you have the time, the Mt Dana climb from Tioga Pass is another good conditioning hike. I found the approach from the Tenaya Lake side to be a bit intimidating. You can see that it is not really a "Knife edge", but the granite is covered with small/fine gravel (I guess the granite sloughs this stuff off), which for me was not something that I was willing to deal with. I did notice a trail off to the left side of the ridge, but did not investigate. Something about going down, on the way up, that doesn't work for me. These pictures were taken with an iPhone, so not as narrow as it appears. The route is amply wide, just the possibility of slipping. I've also done Mt. Dana, but will not do it again. I found it tough on the knees. Since you are in Yosemite, and will likely be driving via 395, and going past Mammoth Lakes I suggest the Mammoth Crest Trail. You can do a loop (~14+ miles), or treat it as an "out and back". Lovely hike, with magnificent views. Yes, the route is fairly wide, there is a risk, but it is just an uneven sidewalk. Here is a photo I posted a few years back on IG, you can see my brother atop the ridge. John's photos are great because they show the sandy, ledge-y nature of the surrounding terrain. You can find your way around the ridge on the SW side for sure if the ridgetop is too rich for your blood. Thankyou for the Pictures. It looks less scary than those I have seen before. It is not that steep to the east. Perhaps it is possible to walk to the right from the Ridge (Just a meter)and hold on to the ridge with my hands ? Or I can creep on mye knees Anyway I am able to summit Clouds Rest. We may try Mount Dana from Tioga Pass as a conditioning hike and perhaps also White Mountain. Since we are going to Grand Canyon as well the peaks near Flagstaff is also on our list. Actually we have too many options for our two weeks trip. We cannot do everything we are thinking about, but Clouds Rest, Grand Canyon and Mount Whitney are our main goals. Erling, there is plenty of room and space up there. I think you will do just fine. You will love the views too, I'm sure. This is a wonderful hike, and good for conditioning, but it is not going to give you much in the way of acclimation quick trip to just under 10k, but not much time above about the elevation of Whitney Portal. As long as you are in the area, you might add and MT Dana (13,000) to the program. 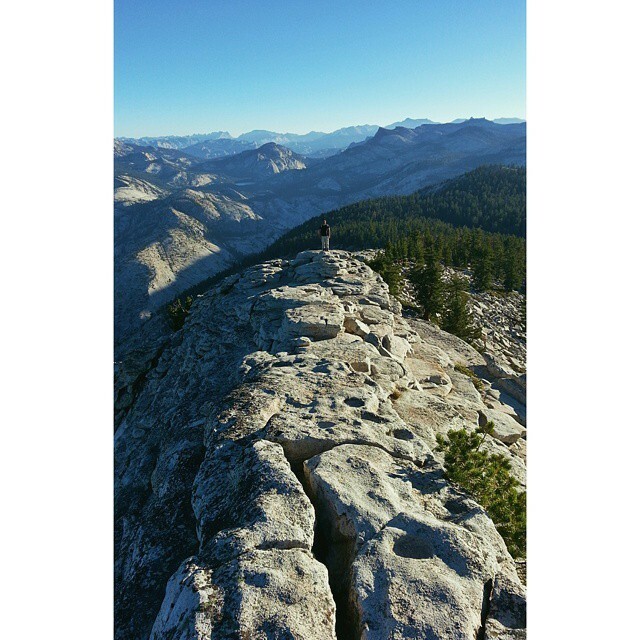 We summited Clouds Rest in beautiful weather friday oct. 5. I was a bit nervous up the ridge. I walked on the less steep left part of the ridge and was not exposed to the more steep right side of the ridge. The view from the summit was beatiful and fun to look down on Half Dome. I could feel the effects of the altitude, more heavy to breathe, but nothing more. I believe it helps a little preparing for Mt Whitney. Great hike, only 1700 feet or so above the TH, but it's up and down there and back. More difficult than you would expect, but so so rewarding. Did it July 13th the day the fires started. Generated in 0.080 seconds in which 0.072 seconds were spent on a total of 14 queries. Zlib compression disabled.